Brant Dubovick, head brewer at the soon-to-open Dryhop Brewers, remembers a quote he heard while attending the Craft Brewers Conference in San Diego earlier this year: “If your number one concern as a craft brewer isn’t quality, get out right now.” That quote stuck with him and motivated him to reach out to the breweries-in-planning around Chicagoland and organize a sensory analysis class. And, since he knew of my support of the next wave of Chicago craft breweries, he invited me to attend and participate. Such a class outlines potential off flavors that can appear in beer, as well as their root causes. Dubovick arranged to have the class at Haymarket Pub and Brewery in the West Loop over two sessions. Steve McKenna, a Research Associate Chemist at Ineos with a PhD in Chemistry from UC Berkeley and BJCP national-ranked beer judge, superbly moderated the class in a supportive, welcoming atmosphere. The base beer was Bud Light and we were all given an unadulterated version to get acquainted with the original flavor. I have not had Bud Light in quite a long time and this just reaffirmed that I shouldn’t; it was bland and watery and had no discerning qualities that I could pick up. I’ll stick to craft beer, thank you very much. The first doctored beer was handed out and I was alarmed to find out it was a vast improvement over the original. It turns out that this sample contained pure alcohol, so basically it was Bud Light Platinum. McKenna passed around vials of fusol alcohol to smell to get a better understanding of how it smelled in its natural form. He explained that this is a result of unhealthy yeast and can also be detected by a burning sensation in the back of your throat. 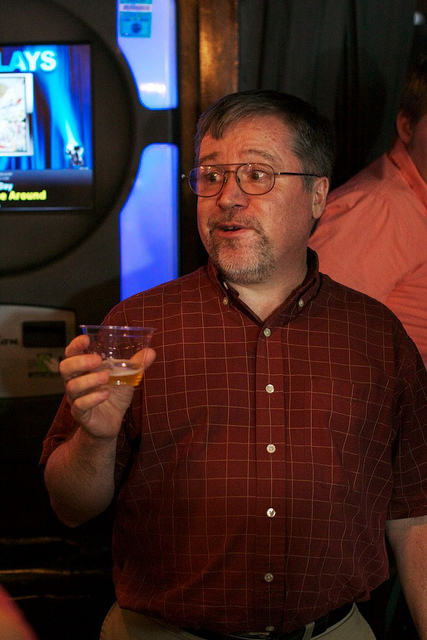 The second doctored beer had a medicinal aroma and a dry, bitter flavor. I could not for the life of me figure out what the doctored flavor was but it turned out it was just an increase in IBUs. Basically, hop water was added to the base beer. This was also an improvement to Bud Light. I was unable to pick up any apparent aroma from the next doctored beer but Meghan from 4 Paws Brewing knew it immediately and volunteered ‘geranial.’ According to her, the aroma was floral and rose-like. McKenna tried to make the rest of us feel better by saying that this was one of the most difficult ones to pick up due to its subtle and delicate aroma. The next sample was doctored with banana esthers that made the Bud Light taste like a Hefeweizen Light. These esthers are similar to apple esthers, which was the flavoring added to our next sample. Both of these are high temperature fermentation by-products and can be a result of poor yeast health. The banana esthers clearly tastes like banana, but the apple esthers had a bit of licorice on the back end and overall tasted like pineapple. While banana esthers are common in hefeweizens and certain Belgian beers, apple esthers are typically never appropriate for beer athough it can be present in certain ales. The next doctored beer contained ethyl acetate that smelled like nail polish remover. This is caused by high fermentation temperatures and poor yeast health, and is not appropriate for any beer. While apple esthers smell and taste vaguely like pineapple, acetaldehyde has a sharp green apple aroma. Apparently, Bud Light has some of this off-flavor already present in it because Anheauser-Busch cuts its fermentation short in order to get it out into the market faster. Its causes are similar to diacytl, the next doctored beer. 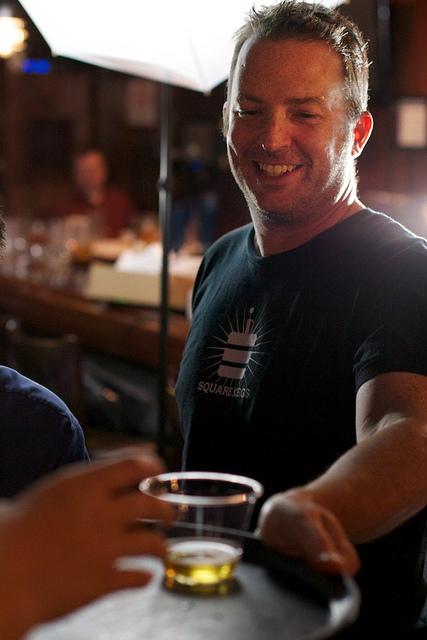 Panic Brewing’s Gary Gulley serves doctored beer during the sensory analysis class. Diacytl provides a buttery, butterscotch flavor and a “slick” or oily mouthfeel. In addition to being caused by a premature removal of yeast or poor yeast health, it can also be caused by infection thanks to dirty draft lines. Fermentation is a metabolic pathway from sugar to alcohol, and the fermentation temperatures need to be above 65 degrees in order to get rid of diacytl. As a judge, McKenna sees this off flavor most often in homebrewed lagers. When brewing a lager, you need to incorporate a diacytl rest where you crank the temps up to 65 degrees before dropping them back down to lager temperatures. Our next doctored flavor had a clean sourness but without an additional flavor. There was no aroma; just sourness in the flavor that was provided by the addition of lactic acid. Similar to this off flavor is acetic acid except this one has the tell-tale aroma of vinegar. Both of these flavors/aromas are caused by bacterial infections but lactic acid is the one you want when brewing lambics, Berliner Weisse, or other sour beers. My hubby’s favorite off-flavor was butyric. While the flavor is described as rancid butter and putrid, hubby thought it tasted like Cheetos. Yes, Cheetos. I guess I will have to do some research to see if Frito-Lay adds any butyric to get that telltale imitation cheese flavor. While the first class focused on off-flavors that weren’t too unpleasant, McKenna assured us that the flavors we were about to embark on in the second class were especially nasty. The first doctored beer contained oxidation and displayed it’s characteristic wet paper/cardboard aroma and flavor. It was quite disgusting. Next up was ‘grainy’ which I thought smelled like rotten bananas (others described it as wet grain) but is described as tasting husk-like or nut-like. This is not the same as the pleasant, desirable malt flavors or aromas and is caused by oversparging or insufficient boil times. The next adulterated flavor smelled like cherry cough syrup to me but it is labeled as ‘almond.’ I wasn’t completely off the mark, though, as this can be caused by wood barrels that provide that ‘stone fruit’ flavor. This flavor can also be caused by certain yeast strains. 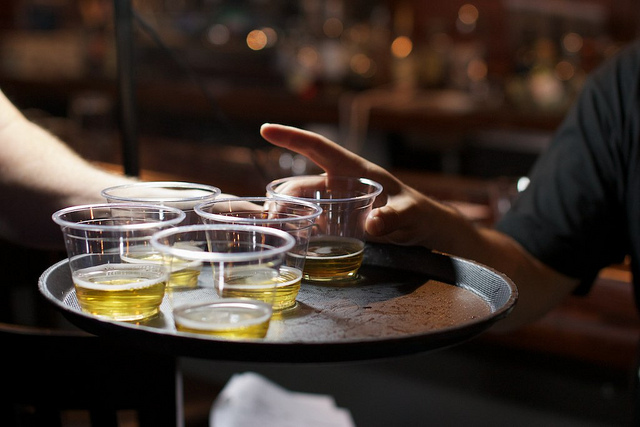 Medicinal was the next off flavor and was literally created by pouring Cloriseptic throat spray into the beer, since this phenol is the main ingredient in Listerine and other products. Wild or mutated yeast or bacteria causes this flavor in beer. Next we tasted the doctored flavor of metallic, which is created by not using stainless steel equipment. Back in the days before food grade liners were added to cans, you could also get this “tinny” flavor. Clove was the next flavor we assessed and I enjoyed this one; it, along with banana esthers, creates the indicative flavor and aromas of traditional hefeweizen. The aroma on its own, though, reminded me of zucchini or banana bread and is caused by specific yeast strains or wild yeast. Astringency presents itself as a dry mouthfeel, similar to that of red wine or black tea. It is a polyphenol that is caused by oversparging that causes extraction of tannins. DMS is a fairly common off-flavor and is apparent in the telling aroma of creamed corn or cooked vegetables. It comes from the sulfery parts of the grain that decomposes during the boil and is caused by boiling or cooling in a closed vessel. So, all of you homebrewers out there, never cover your boil pot or DMS could become a reality in your beer. Unfortunately, it is now tolerated in light American lagers since corn adjunct is added to many of them. It was truly heartwarming to be in the presence of Chicago’s next generation of breweries and watch them share TTB horror stories and talk shop. While in any other profession each of these individuals would be competitors, here they are friends. For me, this class was a reunion of sorts; I have been introduced to and/or interviewed many of the individuals present for my blog over the last year, such as Spiteful Brewing, 4 Paws Brewing, Dryhop Brewers, Begyle Brewing, Panic Brewing, Une Annee, New Oberpfalz, Low Dive Brewing, and Corazon Brewery. And I had the opportunity to meet some new brewers, too, and I am very excited that I can now put faces to the names of Temperance Brewery (Evanston, IL), South Loop Brewing, Lake Effect Brewing Company, and Atlas Brewing. 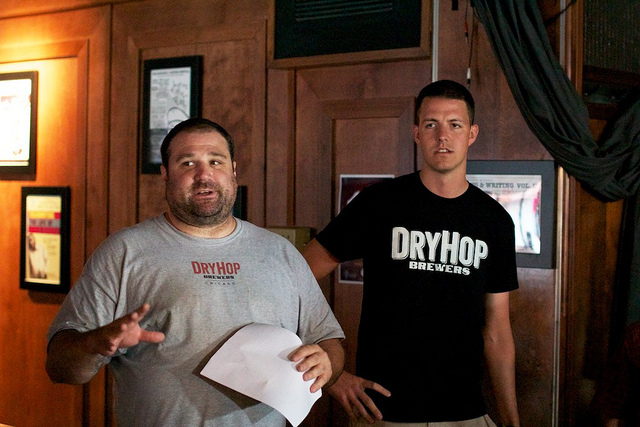 A huge thank you to Brant Dubovick and Greg Shuff of Dryhop Brewers for organizing this class; Haymarket Pub and Brewery for hosting us; Steve McKenna for providing his knowledge and expertise; and the next generation of Chicago’s brewers for joining together to ensure that Chicago has the best beer in the country. And thanks to the brewers for bringing in test batches for all of us to sample. This class was a resounding success and it has been suggested to have similar classes once every three months or so. 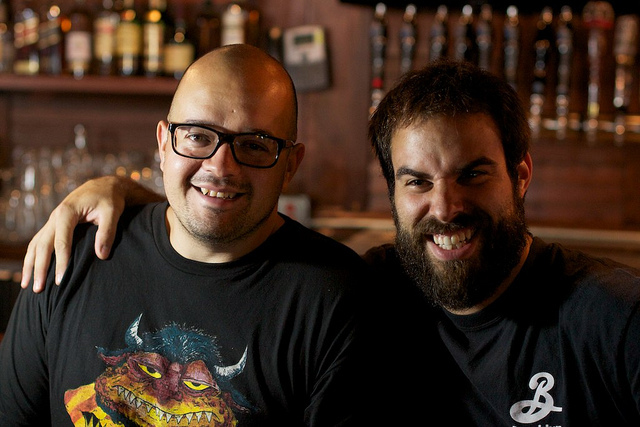 It is exciting that this new crop of brewers is taking their craft seriously and we, as Chicagoans, will reap the benefits for many years to come. For my photos from both sessions of the sensory analysis class, visit Christopher Murphy’s photostream. I had never been aware of all the science involved in beer brewing until my son, Gary Gulley of Panic Brewing, was involved (obsessed) in the process! Your article was a nicely detailed narrative of the process. Thanks Carolyn! Yes, it is very easy to become obsessed with beer and the brewing process. I’m so glad that I was invited to participate in this class! Cheers! Mom, the nursing home said they wouldn’t let you near a computer anymore!